Our logo, again. 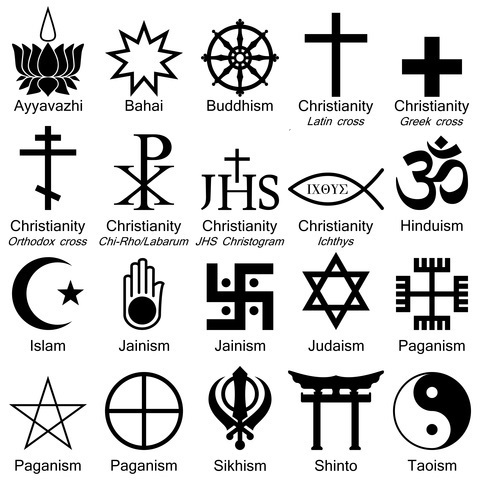 Religious symbols. "The truth was a mirror in the hands of God. Everybody took a piece of it, and they looked at it and thought they had the truth." "Don't speak to me about your religion; first show it to me in how you treat other people. In the end, I'm not as interested in what you have to tell or sell as I am in how you choose to live and give." The old man replied simply: 'The one you feed'." "Your actions are so loud, I can hardly hear what your saying." "Preach the Gospel at all times. When necessary, use words." Thus we include here all of the great monotheistic religions, Eastern religions; Neopagan religions; a wide range of other faith groups, spiritual paths, & ethical systems; and beliefs about the existence of God(s) and Goddess(es). We recognize that most people define "religion" in a much narrower manner. What is our web site's "unhidden agenda?" Many religions, many subdivisions within religions, and many secular philosophies have a holy book or tradition that promotes an ethic of reciprocity, like the Golden Rule. This promotes harmony and caring. But many also have passages and sections that are often interpreted as promoting hating and even the extermination of "the other" -- those people different from themselves. We feel that if the human race is going to survive into the next century without destroying itself in a religiously triggered nuclear war, then we are going to have to learn how to get along with other faith groups much better than we have in the past -- both with people within our religion and with those of other religions, and none. The best way to promote this is to spread accurate information about other religions, so that people can understand not only what others believe, but why they believe it. That is our main goal. Another goal is to help believers become aware of any evil teachings and practices advocated by their faith group in the hope that they will work from within to correct them. These goals differentiate us from at least 99.9% of the other religious web sites on the Internet. Their main goal is to promote the teachings of their webmaster's or sponsoring agency's faith group.